In the aftermath of the Greek bailout there was a lot of talk about the other vulnerable European economies that could have followed the collapse into bankruptcy of the Greek economy. Top of the list of vulnerable Euro zone economies were Portugal, Ireland, Italy and Spain. Of these, the three Mediterranean economies had been controversial additions to the Euro zone, as their economies were seen as weak and problematic, bringing vulnerability to the entire Euro project. Ireland on the other hand was a small economy with a well educated English-speaking population, and of little concern to planners. Most recently though, some of the largest and most militant demonstrations have occurred in Britain, where the Tory-Liberal Democrat coalition has implemented a harsh round of austerity measures, described as the most severe since the end of the Second World War. A common thread of the anti-government actions throughout Europe has been the demand the workers should not be forced to pay for a crisis that they did not cause. The British government’s announcement that the university fee maximum would be trebled brought tens of thousands of students onto the streets of London. A group of students stormed and briefly occupied the Conservative Party’s headquarters while thousands of other students outside hampered Police efforts to intervene. Students and opposition politicians have been particularly merciless in their condemnation of Liberal Democrat leader and deputy prime minister Nick Clegg, whose pre-election commitment to eliminating tertiary tuition fees has been replaced by support for the massive fee hike. The university fee rise is part of an austerity package that has few precedents in British history. Public sector cuts of ten percent over four years are the deepest since 1921 and will result in the loss of thousands of jobs. Chancellor of the Exchequer George Osborne has declared that the cuts will be borne primarily by those best able to afford them, those with the broadest shoulders”, as he put it. However the Institute for Fiscal Studies has calculated that while the top two percent will feel some of the impact, it is the bottom ten percent who will suffer the most. They calculate that sixty percent of primary school and a phenomenal eighty seven percent of secondary pupils will experience funding cuts, a dramatic contrast with the government’s claim that education will be shielded from the cuts and that schools would in fact benefit from funding increases in real terms. Ireland’s downhill path from “Celtic Tiger” to virtual bankruptcy has been a classic case of the failure of capitalism to deliver. Low (12.5%) corporate taxes and little oversight of the finance sector led to a massively inflated property sector and a huge bubble economy. Low paid workers comprise approximately fifty percent of the Irish workforce and these people have seen little benefit from the fictitious wealth created by the bubble economy of the past decade. Barnados Ireland has warned that there are thousands of families living on or below the poverty line. Meanwhile, the Irish Trade Union movement jumped on the “partnership” bandwagon, signing accords with the government to guarantee productivity agreements and workplace harmony rather than fighting for the rights of their membership. Finally but inevitably, when the financial meltdown occurred, Ireland was one of the worst hit countries in Europe. Bank bailouts handed billions of Euros to the profligate finance capitalists and completed the process of destroying the Irish economy. Normal tools available to governments to fine tune the economy are not available to the Irish government. As part of the Euro zone, Ireland is unable to use changes to its currency and can rely only on tax policy as a lever. Yet the government has been reluctant to tinker with its low corporate rate. Instead, austerity measures totaling €15 billion have been announced. Income tax on the country’s lowest paid workers is set to increase. Currently the lowest paid workers pay no income tax but that is set to change. As if that is not enough, the minimum wage is to be slashed by thirteen percent and benefits are to be cut by five percent. These proposals accord with an IMF prescription for Ireland which called for a cut in the minimum wage, “to make it consistent with the general fall in wages,” and the introduction of “a gradual decrease of benefits over time of unemployment spell and stricter job search requirements”. At the same time, nearly 25,000 public service jobs will be cut. In exchange for carrying out these attacks on the Irish working class, the government has been offered a loan from the EU and the IMF expected to total €85 billion, of which most will be used to further bail out the banks, with an estimated €35 billion being made available to the banks directly. Ireland has seen a number of demonstrations over the past year but the protest on November 28 was huge. Over 100,000 people marched in freezing conditions to vent their growing rage at the planned austerity programme. 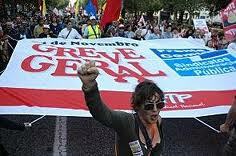 In Portugal, the trade union movement organised the country’s first general strike in twenty two years. Reports suggest that eighty percent of rail services were halted and many flights were canceled as air traffic controllers and airport ground crews walked out. Schools, factories and hospitals were all closed by the strike. Union sources reported that all ports were closed. No mass demonstrations were called by the union movement as part of the general strike but workers organised picket lines outside ports and other work sites in support of the strike. Portugal is the poorest country in the Euro zone has been seen as one of the countries most likely to need a bail out. It has been suggested that any bailout of the Portuguese economy would be in the vicinity of €50 billion. The Portuguese prime minister Jose Socrates however has so far resisted pressure to accept a bail out, claiming that his Socialist Party government’s austerity measures will be sufficient to bring the country’s deficit down to a level acceptable to the European Union. The anti-worker measures proposed by this “socialist” include slashing public sector pay by an average of five percent, freezing state pensions and reducing welfare benefits. Portugal though is only one country that finance capitalists fear could require a bailout. The fear of a “contagion” spreading throughout the weaker European economies has exercised the minds of bankers, economists and other representatives of the ruling class ever since the beginning of the current round of economic woes. Spain, which introduced austerity policies in July, but which is resisting pressure to implement more, is also considered a possible weak link in the Euro system. Unfortunately, despite the significant, and inspiring, scale and militancy of the demonstrations occurring in various countries throughout Europe, there has been little sign of a militant left leadership emerging. In Ireland, most left parties have fallen into line behind the official trade union movement that endorsed the “partnership” model. In Britain, the leader of the student union responded to the storming of the Tory headquarters with a cowardly condemnation of “violence”. Until a strong anti-capitalist leadership emerges, such demonstrations of rage as we have seen throughout Europe recently will remain at the level of angry but ineffective expressions of frustration at a system that can never deliver.